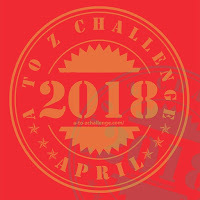 Back in 2011, on a different blog, I took the A to Z Challenge. I blogged every day in April, except Sundays. Each day was based on a letter, but the theme or subject matter is up to the participant. It helped me get out of my comfort zone, it pushed me to write, and it helped me gain so many followers. Which meant I also found tons of new blogs to follow. Bottom line, it was a great thing. I think I signed up the next year, or the year after, or the year after that. One of those years. But I didn't complete the challenge. I might have ONLY signed up, and never even gotten started. It might be crazy, but I'm taking the challenge again this year. Threefold. I am blogging here, on my green blog (Not Easy Going Green), and on my photography blog, Allison and Her Camera. I am really nervous about this, because I am so out of the blogging loop. Look at this blog... watch the tumbleweeds blow by. Ridiculous. I used to write all the time, scheduling posts in advance, writing every day... but that trickled off and I have no clue why, but honestly? I miss it. I miss writing and sharing and creating an online community. I've started outlining a few posts to make sure I have enough to say about each letter of the alphabet. I'll be writing about favorite books, authors, illustrators, characters, and more. It's going to be a lot of work, but here I am, Blogging from A to Z to see what I can create. Follow along, and join up if you're interested!